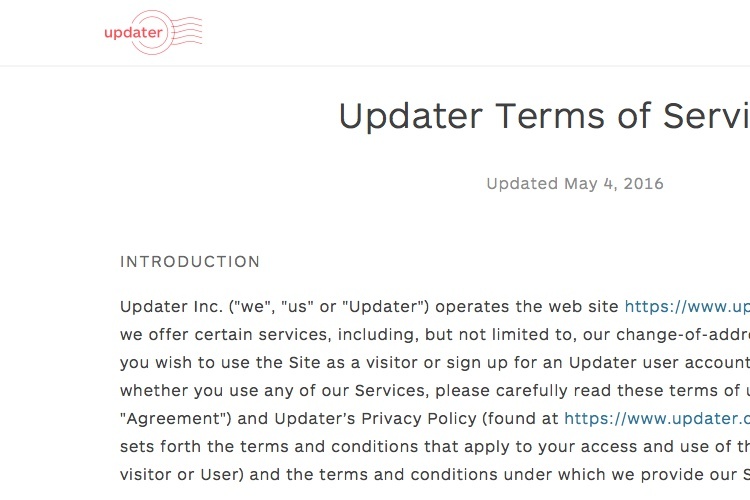 Our list of Terms of Service Templates is up-to-date for Apr 2019. 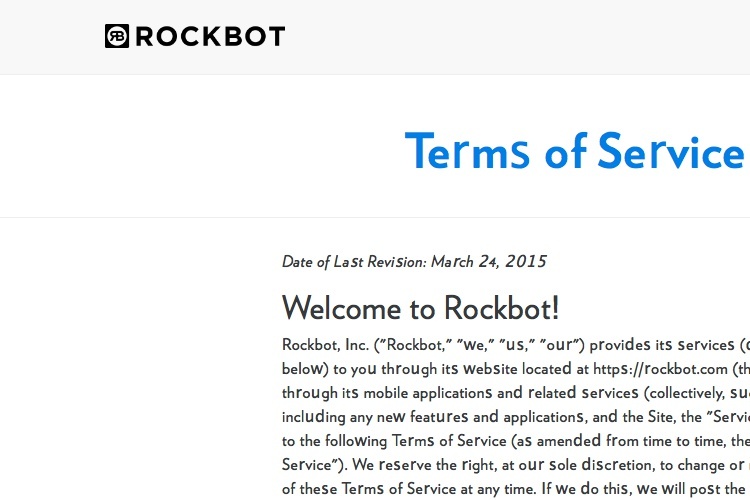 A Terms of Service, while not required by any laws worldwide, is like a contract. You, the website owner, sets the rules that users must follow in order to use your website or mobile app. 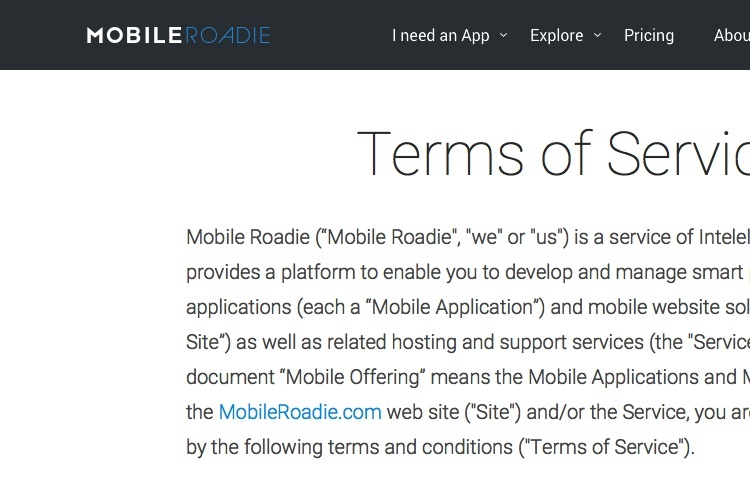 Users of your website or mobile app must then follow the rules you set in the Terms of Service agreement. 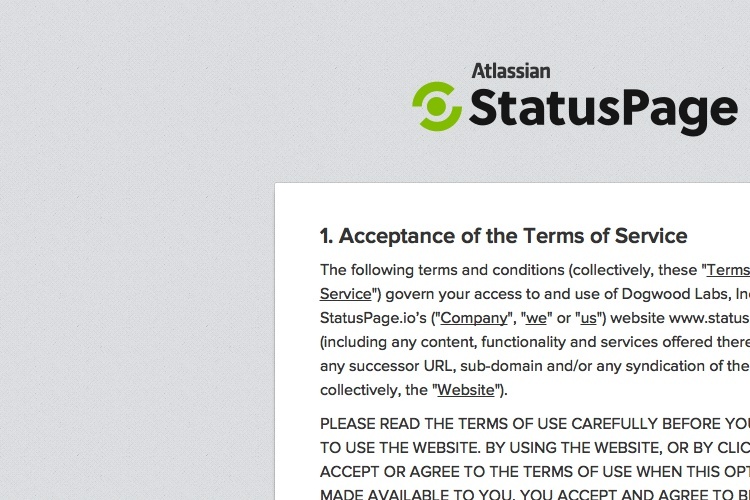 If you're interested in a customized Terms of Service agreement, our Terms of Service Generator is available: enter the information of your website and download the agreement in HTML or Text formats. It has over 4179 words. Your access to and use of the Services or any Content is at your own risk. YOU UNDERSTAND AND AGREE THAT THE SERVICES ARE PROVIDED TO YOU ON AN "AS IS" AND "AS AVAILABLE" BASIS. WITHOUT LIMITING THE FOREGOING, TO THE FULL EXTENT PERMITTED BY LAW, PADLET DISCLAIMS ALL WARRANTIES, EXPRESS OR IMPLIED, OF MERCHANTABILITY, FITNESS FOR A PARTICULAR PURPOSE, OR NON-INFRINGEMENT. Padlet makes no representations or warranties of any kind with respect to the Services, including any representation or warranty that the use of the Services will (a) be timely, uninterrupted or error-free or operate in combination with any other hardware, software, system or data, (b) meet your requirements or expectations, (c) be free from errors or that defects will be corrected, or (d) be free of viruses or other harmful components. Padlet also makes no representations or warranties of any kind with respect to Content; Subscriber Content, in particular, is provided by and is solely the responsibility of, the Subscribers providing that Content. No advice or information, whether oral or written, obtained from Padlet or through the Services, will create any warranty not expressly made herein. It has over 1005 words. 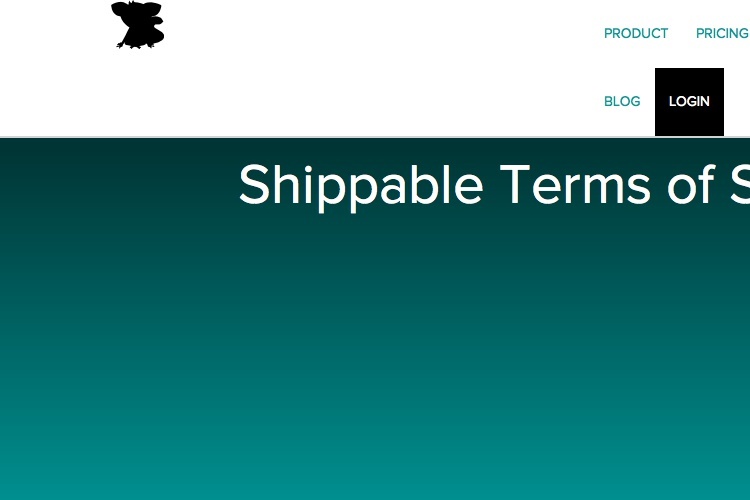 cancellation and cannot be recovered once it is deleted. It has over 5922 words. 4.1 Use and Disclosure. 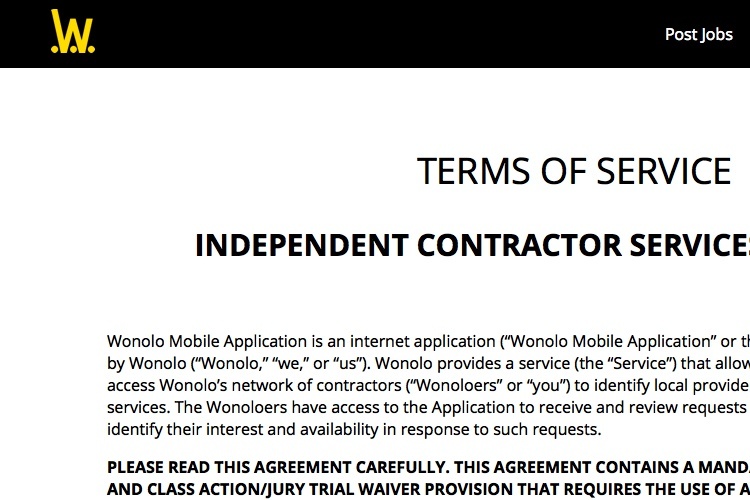 From time to time, you may be given access to confidential information in the course of performing engagements that you receive through Wonolo. During the term of this Agreement and at all times thereafter, you will (a) hold all Confidential Information in strict trust and confidence, (b) refrain from using or permitting others to use Confidential Information in any manner or for any purpose not expressly permitted or required by this Agreement, and (c) refrain from disclosing or permitting others to disclose any Confidential Information to any third party without obtaining Wonolo’s express prior written consent on a case-by-case basis. “Confidential Information” means any and all information related to Wonolo’s or any Customer’s business (including trade secrets, technical information, business forecasts and strategies, marketing plans, customer and supplier lists, personnel information, financial data, and proprietary information of third parties including Customers) that Wonolo and/or the Customer considers to be confidential or proprietary or Wonolo has a duty to treat as confidential. It has over 1936 words. 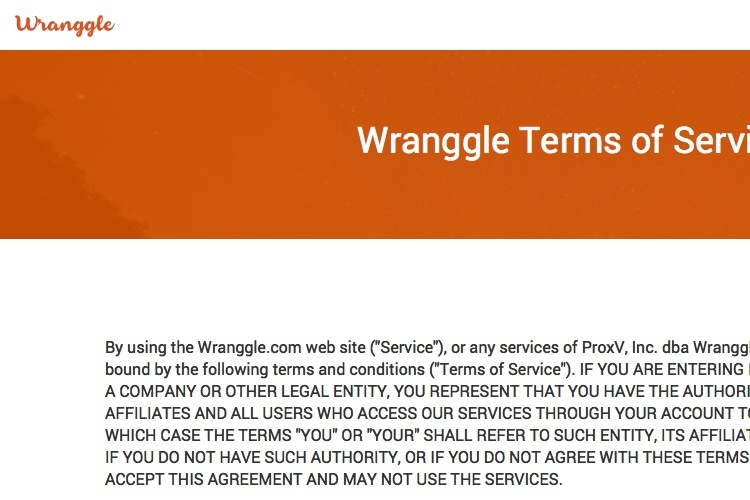 You are solely responsible for properly canceling your account via email to support@wranggle.com.All of your Content will be immediately deleted from the Service upon cancellation. all current or future use of the Service, or any other ProxV service, for any reason at any time. to your Account, and the forfeiture and relinquishment of all Content in your Account. ProxV reserves the right to refuse service to anyone for any reason at any time. It has over 10782 words. Contacting Pogoseat Regarding this Website. Unless you opt out, we may use your PII to send you information about Pogoseat and its services as well as promotional material on behalf of some of our partners. If at any time you change your mind and prefer to no longer receive such marketing communications from us, please see the "Opt-Out Policy" section below. Pogoseat may use your PII to fulfill the purpose for which such PII was provided (e.g., using your name and email to confirm your registration or using your credit card information to fulfill your purchase). This Website may offer merchandise and/or other services, which may be offered by us or by one of our e-commerce partners. To the extent the merchandise and/or services are offered by one of our e-commerce partners, such e-commerce partner will be collecting and using the PII you provide. For more information regarding your transactions with our e-commerce partners, please refer to Transactions With E-Commerce Partners, Vendors and Advertisers, below. 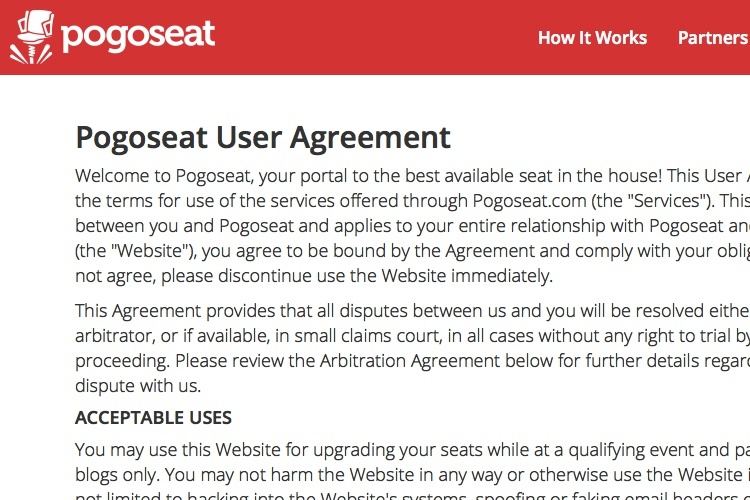 To the extent Pogoseat is the entity offering a purchase service, when you make a purchase through the Website, we may collect your credit card number or other payment account number (for example, your PayPal account number), billing address (including zip code) and other information related to such purchase (collectively, "Payment Information") from you. We will use the Payment Information that you provide to bill you for your purchase and to fulfill your purchase. We may also use your Payment Information to allow us to ship or deliver merchandise and/or receipts to you, respond to customer service requests, review and enforce limits on the purchase services offered and to help prevent credit card fraud. By providing your Payment Information, you are authorizing us to give that information to third parties as necessary to confirm and fulfill your order (for example, to process your credit card or payment account number and to send you products you have ordered). It has over 15256 words. 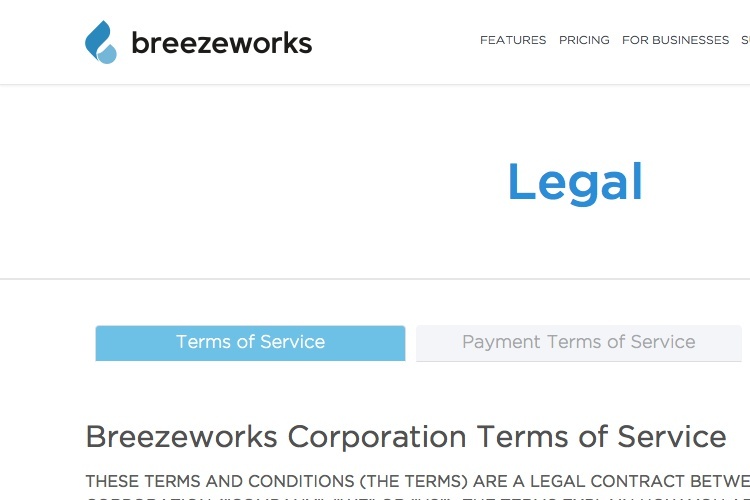 At any time and from time to time, we may temporarily suspend or delay payments to you and/or designate an amount of funds that we must maintain in a Breezeworks Account (“Reserve”) to secure the performance of your payment obligations under this Agreement. We may require a Reserve for any reason, including high chargeback risk or indications of performance problems related to your use of the Service. It has over 2474 words. It has over 3813 words. NEITHER SIMPLEE NOR THE SERVICES ARE INTENDED TO PROVIDE LEGAL, HEALTH OR FINANCIAL ADVICE. 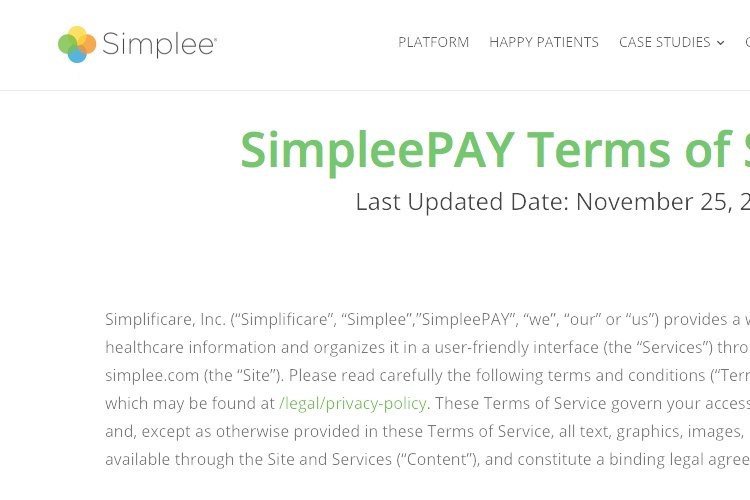 SIMPLEE IS NOT A HEALTHCARE OR FINANCIAL PLANNER OR ADVISOR. The Services are provided in order to assist you in organizing, understanding and managing your healthcare-related spending and are broad in nature and in scope. Your personal healthcare-related financial situations are personal to you, and any general information and advice obtained through the Services may not be appropriate or relevant for your personal situation. Accordingly, before making any final decisions or revising any financial or healthcare-related strategies, please consider obtaining additional information and advice from professional advisors who familiar with your personal circumstances. 2. Subscription and Subscription Date. 6. Service Access and Use Rights. 11. Rights Grants to Datadog. 15. Effect of Expiration or Early Service Termination. Datadog will make various application program interfaces (APIs), agents, libraries and other materials available at the Site or through the Service from time to time in its discretion to support Customer’s access and use of the Service (collectively, “Agents”). Customer acknowledges and agrees that: (a) the Agents may only be used on systems owned, leased or primarily operated by Customer, (b) the Agents are made available solely to support access and use of the Service, and Datadog has no liability with respect to any other uses of the Agents, and (c) certain of the Agents may include third-party content that is subject to open source license terms that may expand or limit Customers’ rights to use such content. Customer agrees to review any electronic documentation that accompanies the Agents or is identified in a link provided to Customer to determine which portions of the Agents are open source and are licensed under open source license terms. To the extent any such license terms require that Datadog provide Customer the rights to copy, modify, distribute or otherwise use any open source software in the Agents that are inconsistent with the limited rights granted to Customer in this Agreement, then such rights in the applicable open source license terms shall take precedence over the rights and restrictions granted in this Agreement, but solely with respect to such open source software. Further, Customer acknowledges and agrees that all third-party content is governed by its respective terms and such terms are solely between Customer and the applicable licensor. 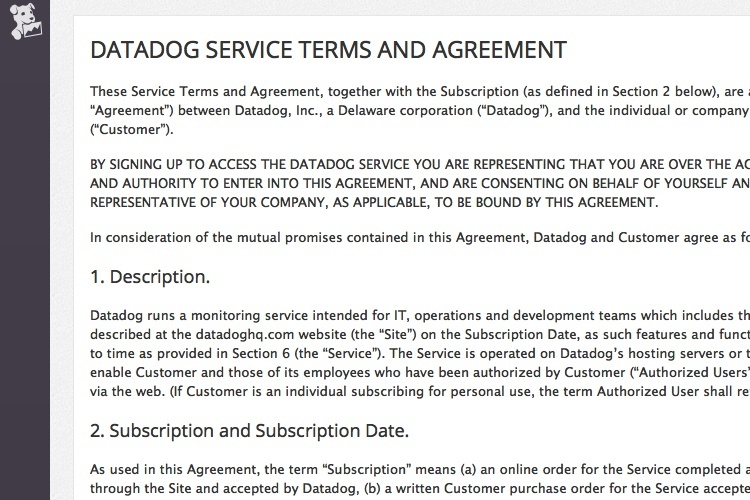 Customer agrees to comply with such third-party terms (including open source license terms), as applicable, and Datadog has no liability with respect to third-party content under this Agreement. Authority. Merchant represents and warrants that (i) Merchant has full corporate right, power and authority to enter into these Terms of Service, (ii) the execution of these Terms of Service by and the performance of its obligations and duties hereunder do not and will not violate any agreement to which Merchant is a party or by which Merchant is bound, and (iii) when executed and delivered, these Terms of Service will constitute your legal, valid and binding obligation, in accordance with its terms. Compliance with Law. 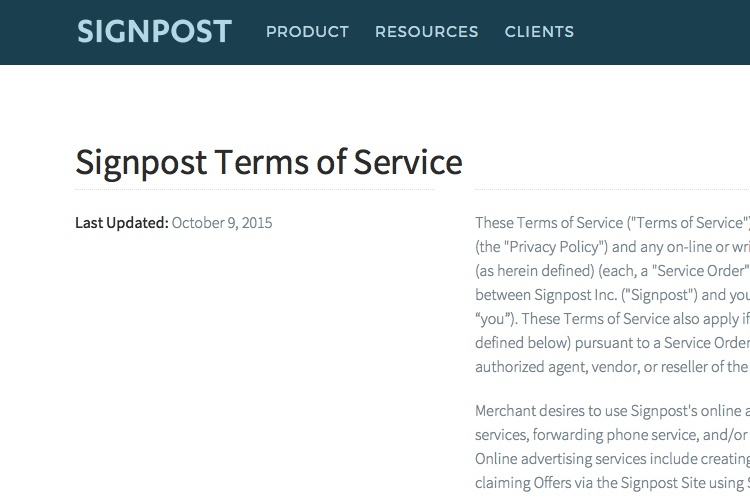 In connection with the subject matter of these Terms of Service, Merchant agrees to, and warrants and represents that it shall, comply with all applicable United States Federal and State laws and regulations, including but not limited to any State or Federal laws that govern online promotions, offers, gift cards, coupons, and/or gift certificates data privacy and protection, sending of electronic marketing messages including but not limited to the CAN-SPAM Act of 2003, and HIPAA. Validity of Offers. Merchant warrants that any Offer, upon claim by a customer whether on the Signpost Site or a Third-Party Partner Site or otherwise, shall be available for redemption by such customer. Merchant agrees to comply with the Offer terms and conditions as set forth in a particular Offer or any other advertising or marketing terms or Offers made available to Merchant's customers or potential customers via the Services, and shall at all times honor the terms of any Offer offered or otherwise promoted via the Services. This Section 7.3 shall remain in effect regardless of whether Merchant is currently using the Services. Authorization and Account Information. Merchant represents and warrants that: (i) the information Merchant provides in connection with Merchant's registration for the Services is accurate and complete; (ii) if Merchant is registering for the Services as an individual, that Merchant is at least 18 years of age and has the legal capacity to enter into these Terms of Service; and (iii) if registering for the Services as an entity or organization, (a) Merchant is duly authorized to do business in the country or countries where it operates, (b) the individual accepting these Terms of Service and completing the registration for the Services meets the requirements of subsection (ii) above and is an authorized representative of Merchant, and (c) Merchant's employees, officers, representatives and other agents accessing the Services are duly authorized to access the Services and to legally bind Merchant to these Terms of Service and all transactions conducted under Merchant's account. It has over 4616 words. It has over 3556 words. It has over 5746 words. 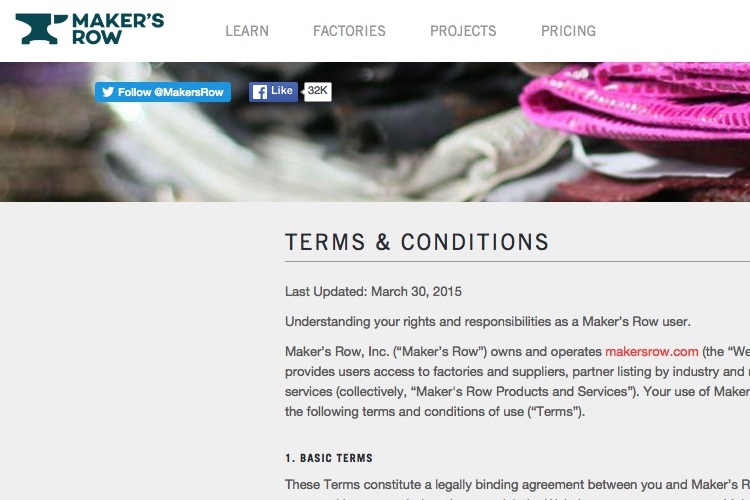 By submitting any unsolicited information and materials, including but not limited comments, ideas, questions, designs, and other similar communications (collectively, “Unsolicited Information”) to Maker’s Row, you agree to be bound by the following terms and conditions. 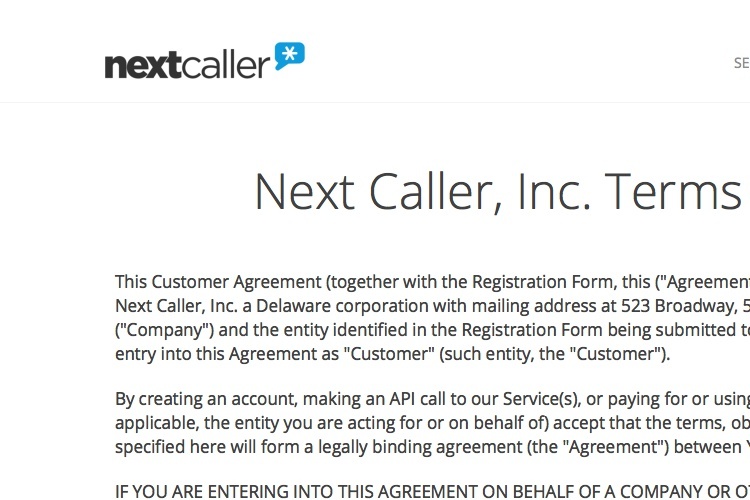 If you do not agree with these terms and conditions, you should not provide Maker’s Row with any Unsolicited Information. All Unsolicited Information will be considered NON-CONFIDENTIAL and NON-PROPRIETARY. Maker’s Row, or any of its affiliates, may use such communication or material for any purpose whatsoever, including, but not limited to, reproduction, disclosure, transmission, publication, broadcast, and further posting. Further, Maker’s Row and its affiliates are free to use any ideas, concepts, know-how, or techniques contained in any communication or material you send to Maker’s Row for any purpose whatsoever, including, but not limited to, developing, manufacturing, and marketing products. By submitting any Unsolicited Information, you are granting Maker’s Row a perpetual, royalty-free and irrevocable right and license to use, reproduce, modify, adapt, publish, translate, distribute, transmit, publicly display, publicly perform, sublicense, create derivative works from, transfer and sell such Unsolicited Information and to use your name and other identifying information in connection with such Unsolicited Information. It has over 3510 words. 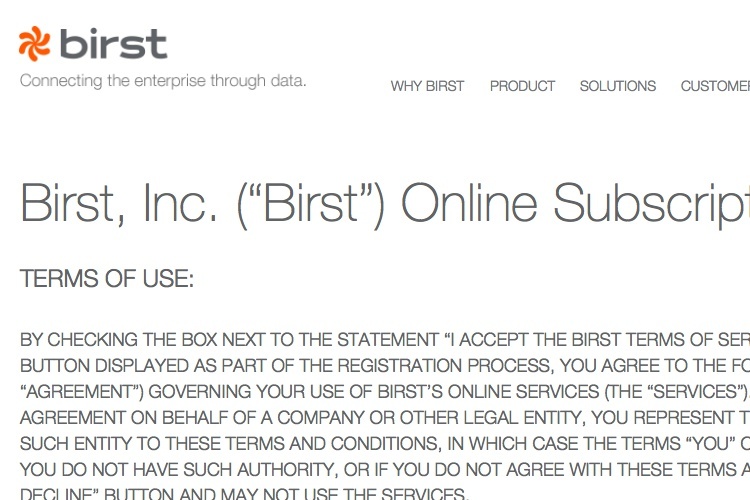 Birst charges and collects in advance for use of the Services. Customer shall be responsible for all taxes associated with Services other than U.S. taxes based on Birst’s net income. You agree to provide Birst with complete and accurate billing and contact information. This information includes your legal name, street address, e-mail address, and name and telephone number of an authorized billing contact. You agree to update this information within 30 days of any change to it. If the contact information you have provided is false or fraudulent, Birst reserves the right to terminate your access to the Services in addition to any other legal remedies. Unless Birst in its discretion determines otherwise, you will be billed in U.S. dollars and subject to U.S. payment terms. others to view and share your Content via your Mobile Offering. Content selected by you for use in connection with your Mobile Offering. Bitium’s Responsibilities. Bitium will: (i) provide commercially acceptable levels of support for the Services, (ii) use commercially reasonable efforts to make the Services available 24 hours a day, 7 days a week, except for: (a) scheduled maintenance and downtime (regularly scheduled for Saturday at 8:00pm PT; if other scheduled downtime is required, Bitium will give at least 24-hour notice via the Services and/or email, and will use commercially reasonable efforts to schedule during non-business hours in the United States), or (b) any unavailability caused by circumstances beyond Bitium’s reasonable control, including without limitations, floods, fires, earthquakes, civil unrest, acts of terror, strikes or other labor problems, internet service provider failures or delays, or denial of service attacks, and (iii) provide the Services in accordance with applicable laws and government regulations. Customer Responsibilities. Customer will: (i) be responsible for compliance with this Agreement by Customer and Customer’s Users, (ii) be responsible for the accuracy, quality and legality of Customer Data and the means by which Customer Data is collected, (iii) use reasonable efforts to prevent unauthorized access to or use of the Services or Software, and notify Bitium immediately of any such unauthorized access or use, and (iv) use the Services and Software only in accordance with Bitium’s instructions and all applicable laws and government regulations. Customer will not (a) make the Services or Software available to anyone other than Customer’s Users, (b) sell, resell, rent, lease, license or sublicense the Services or Software, (c) use the Services or Software to store or transmit libelous, infringing or otherwise unlawful or tortious material, or to store or transmit material in violations of third-party privacy rights, (d) use the Services or Software to store or transmit viruses, worms, time bombs, Trojan horses, or other harmful or malicious code, files, scripts, agents, or programs, (e) interfere with or disrupt the integrity or performance of the Services or Software or third-party data contained therein, (f) attempt to gain unauthorized access to the Services or their related systems or networks or Software, or (g) violate any intellectual property rights of Bitium, including but not limited to, Bitium trademarks, copyrights, patents, etc. Customer Passwords Provided Outside of the Bitium Services. 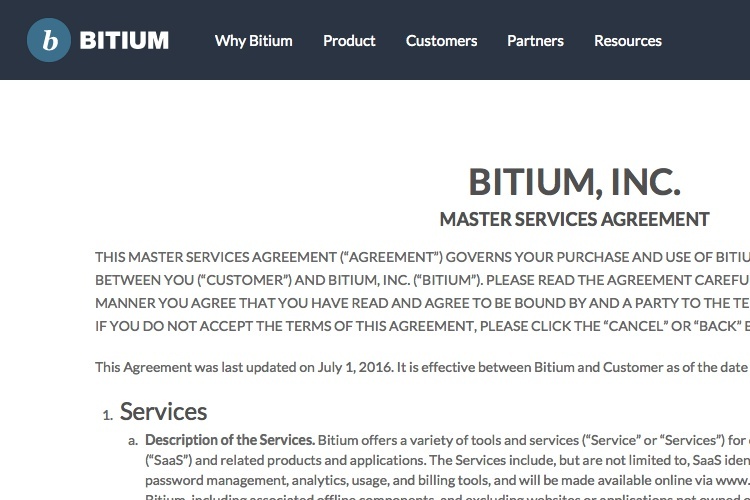 In the event that Customer intentionally or accidentally provides Bitium with usernames, passwords, or other credential information (collectively, “Credentials”) outside of the Bitium Services (for example, via email, customer support communications, access to documents, and/or other insecure means of communication), Bitium is not responsible for any consequences resulting from such un-secured disclosure of Credentials. In the event that this type of disclosure occurs, it is Customer’s responsibility to ensure that Credentials are changed or otherwise secured in order to prevent any unauthorized access or other consequences.